Since my job requires me to spend most of my day staring at a computer, I've begun to think cute glasses might be a good investment for me. I usually wear contacts, and they've begun to fall out (!) during long days. I have a pair of glasses that work well enough... but then I saw Warby Parker. All of their glasses are $95, very stylish, and they let you try on 5 pairs of your choosing for 5 days for free. Did you hear that?! Can't beat that deal. So, I ordered. I was looking for relatively delicate frames since I have petite features, and wanted rounder lenses. Glasses are hard to shop for. I'm very thankful WP let's you try on 5! First up, Chandler in whiskey tortoise. Gettin' sassy! Watts in blue sapphire. Lastly, Watts in sugar maple. WP must've seen my face before sending these because as I moved left to right in the box they fit my face better and better. I really loved the Watts in sugar maple, and had fun wearing them around the house (I'll be honest, I wasn't brave enough to wear them out). Our newlywed budget doesn't allow for a lot of spending, but maybe I'll take the plunge soon and purchase! 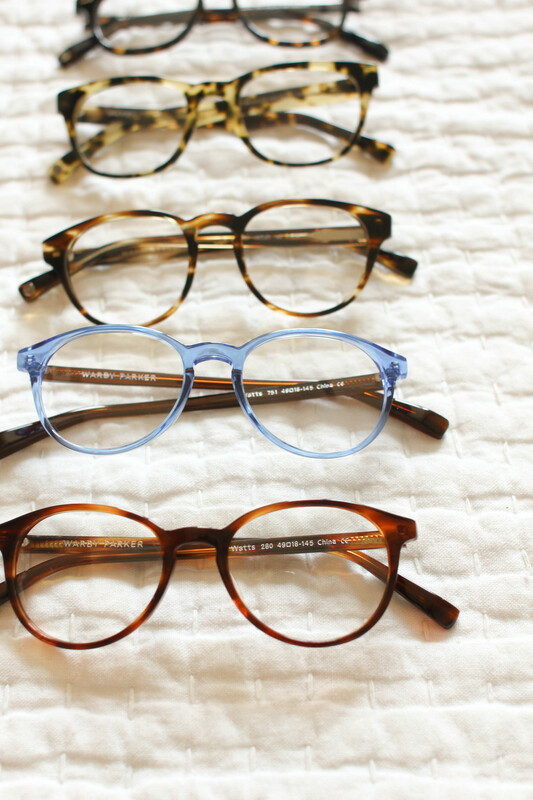 Seriously, Warby Parker made shopping for glasses easy and fun. Plus, for every pair purchased, they give away a pair to someone in need. Way to go, guys. PS - The winner of the #TPAheartofgold giveaway is Emily Moses! Congratulations, Emily; I can't wait to see how you rock it!